My book 'Sketches from an unscripted journey' is available from Blurb. See link below. The book is also available from my online bookshop at Blurb. Order here. "A good drawing is like a song. Like a lingering melody continuing to sing even after the music has stopped…. This is Michael Carroll's book. The songs and the drawings, the things dealing directly with memory - the road ahead, letters, post cards scribbled in coffee shops, lightning sketches, reminiscences of home, all return you to the romance of the journey…. Michael Carroll is Gulliver, the wanderer broken free of his bonds. Travel is in his blood and being an artist is his ticket of leave. From Asia to Italy to the Mediterranean to the Australia desert - the traveller owns the world…. The great value of a book of this kind is that it offers you images so personal, so true and natural that you can almost smell them. The book lets you gaze and gaze, it DELIVERS you the world…. 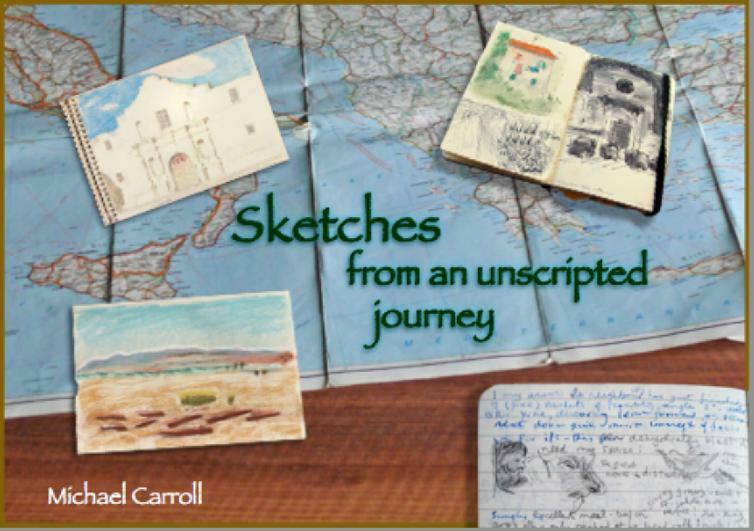 I recommend Sketches from an Unscripted Journey - a gentle book from a gentle hand. It takes you where your dreams could hope to go.